PFLAG National dates back to 1972 when Jeanne Manford marched in the Christopher Street Liberation Day Parade (a precursor to the Pride Parade) in New York City with her gay son, holding a sign that read “Parents of Gays Unite in Support of Our Children.” Less than a year later, she held the first PFLAG meeting. Within a few years, an informal network of PFLAG chapters had sprung up throughout the country. Incorporated in California in 1982 PFLAG has become a trusted resource for support, education, and advocacy on behalf of the lesbian, gay, bisexual, transgender, and queer (LGBTQ) community. It now represents more than 400 chapters across the United States with more than 200,000 members and supporters. 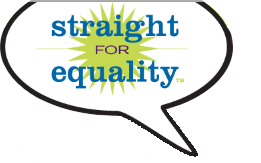 The Straight for Equality program was launched in 2007.This nationwide initiative expanded the organization’s efforts to include more people in the equality movement than ever before. With 45 years of being the family voice in the LGBTQ movement no other organization has as successful of a track record in educating and empowering parents, families, friends, and allies. Since the 2007 launch, Straight for Equality in the Workplace has been our most successful initiative with an always-developing array of learning sessions available to corporations and other organizations in the US. In 2009, PFLAG launched Straight for Equality in Healthcare to educate and engage healthcare providers in all disciplines to be more culturally-inclusive in their work. In 2012, PFLAG launched Straight for Equality in Faith Communities which features faith-focused resources and tools for people of all denominations to start having critical conversations in their faith communities to create more welcoming institutions. And in 2014, Straight for Equality launced Straight for Equality: Trans Allies to help allies continue their journey to become educated, out, and proud allies to the transgender and gender-expansive community. With each passing year, we’re marking new milestones for the program. We look forward to what you’ll be able to add to the list. Welcome.